In April of 2009, while touring with his band People Places & Things, Chicago drummer, Pitchfork Festival producer, Chicago Jazz Fest programming committee chairman and owner of North Side music venue Constellation, Mike Reed found himself in the midst of the biggest Neo-Nazi rally in the Czech Republic (see the scary situation here and here). Reed and his band (two of whom are African-American or mixed race and two of whom are white) were forced to flee, hiding and ultimately being escorted by police to relative safety while the rally died down. Since then, Reed has had a desire channel this negative experience into an artistic one – and on November 20th at the Art Institute of Chicago as part of their Extensions Out Series produced by gallery owner/SAIC professor and jazz critic/author John Corbett, Reed will premiere Flesh & Bone, a new multi-media work inspired by his and his band’s experience. On his website, Reed & his band members share various aspects of what transpired that day – his thoughts and reflections, as well as a portal to his artistic process. Along the way leading up to the premiere, he’ll be posting conversations with a variety of creative people to capture their thoughts, struggles and tribulations in a world of changing contexts within the larger confines of race and racial politics. 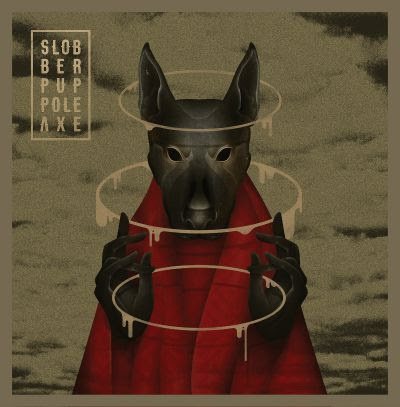 Slobber Pup is a collaboration between Jamie Saft on organs and synths, Joe Morris on guitars, Mats Gustafsson on sax, and Balazs Pandi on drums. Given some of the recent works featuring these gentlemen, such as Cuts of Guilt, Cuts Deeper and The Spanish Donkey’s Raoul, one might go into this soon-to-be-released 2013 recording with a rough idea of its character. And these assumptions will probably not be far from the mark. Each contributor has his trademark style, such as Morris’s aggressively idiosyncratic guitar, Pandi playing the drums as a lead instrument, and Gustafsson’s squawks, drones, and extended techniques. If anyone takes something of a background role, it is Saft, whose subtle organ establishes a solid base upon which the others improvise. But this is not a total in-your-face recording. There is a surprising amount of spaciousness amongst the busyness, with each instrumentalist given ample time to showcase his individual efforts. The album begins with the 29-minute Pole Of Combustible Memory, a deliberately-paced journey that explodes into an outside free-for-all around the two-thirds mark. Bring Me My Desire And Arrows To Shoot begins with discordant drones and showcases Gustafsson in a prominent role, providing rough textures and atmospherics. The album concludes with Incendiary Axe, a short burst of energy which features a blistering sax line over crazed drumming. Saft’s organ sweeps then come into play, as well as Morris at his speed-picking best. Pole Axe will be released on October 30 by RareNoiseRecords. Roger Reynolds (b. 1934) is a composer whose career and music seem to be built on harmonizing apparently divergent paths and influences. Trained as an engineer after having studied piano seriously when young, he left a job as a missile systems development engineer to return to school to resume study of the piano. He ended up a composition student of Ross Lee Finney, was a co-founder, with Robert Ashley and Gordon Mumma, of the experimental, multi-disciplinary ONCE Group in Ann Arbor, and spent time at IRCAM in Paris. His compositions draw on the divergent traditions of American experimentalism and the European avant-garde; much of his work involves intermedia crossings of music, theater, dance and spoken word as well as the integration of analogue and digital electronics with acoustic instruments. With this fine new collection of recent work, though, Reynolds addresses the most basic of purely musical situations: the unaccompanied, unenhanced acoustic instrument. 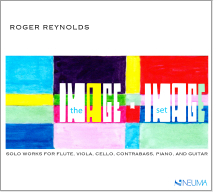 The imagE-imAge series consists of linked pairs of related but contrasting compositions for solo instruments. The imagE half of each pair is lyrical—Reynolds characterizes these pieces as “evocative,” hence the upper-case “E”—while the imAge pieces, which Reynolds describes as “articulate,” are instead made up of distinct sections of heterogeneous sounds and musical gestures. With each pair, Reynolds is able to bring out seemingly opposed but in fact complementary aspects of each instrument’s expressive and technical potential. The imAge compositions are marked on the surface by moments of disjunction and musical parataxis, often embodied in staccato dissonances and dramatic leaps of register. The imAges for piano (played by Yuki Takahashi) and guitar (Pablo Gómez) feature abruptly sounded, tension-filled chords at extreme ranges, broken in the piano’s case by repeated patterns of chromatic tones. The imAge for viola, played by Mark Menzies, casts these basic tropes for bowed strings, exploiting string techniques such as tremolo bowing and brief, rapid runs played in one bow. For the other two string instruments represented here the approach is different. The imAge for cello explores variations in color as cellist Alexis Descharmes mixes pizzicato with conventional and spiccato bowing, underscored by dramatic dynamic contrasts. Double bassist Mark Dresser performs the imAge that Reynolds wrote specifically for him; the highly percussive piece reflects Dresser’s rich engagement with harmonics, which here are plucked and struck. The contrast between this and the imagE for double bass is perhaps the greatest of any of the pairs. Played entirely arco, the harmonics and melody lines, many of which are made up of minor seconds separated by register, flow smoothly, creating a sense of continuity despite the gaps between the notes. Like imagE for double bass, the other imagE pieces tend to be highly chromatic and, like their imAge counterparts, range across extremes of register. The sense of continuity and lyrical flow is often imparted by expressive dynamics, as in imagE for viola (played by John Pickford Richards), or the alternating of long lines and fluid, rapid passages, as in the pieces for cello and for flute (Rachel Beetz). For guitar and piano (Eric Huebner plays this latter), Reynolds unravels harmonies into arpeggios and other horizontal lines. Ozky e-Sound’s 100th release is out, and available for listening. Legendary free-jazz drummer Abbey Rader’s “Get Free” documentary is available for streaming and purchase. Jonah Parzen-Johnson (the first interviewee on AMN) has written a travelogue of his recent tour, which is available as a book. Infinitus Ensemble’s Scherbenschlaf (Sleep of Shards) is now out on CMP.